Heading down south I’m afraid. Chap flying up from Heathrow on Thursday. Nice one Ali. Is the money spent yet?! Pete: sorry matey, you’ll just have to buy mine instead! alicrozier wrote: Heading down south I’m afraid. Chap flying up from Heathrow on Thursday. He's going to love the drive home. Bit of M6 for a break. If you need to go even faster, just imagine you are me. 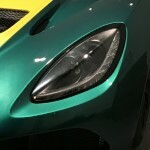 If your sad about the Evora going, then the 211 is not going to be any easier for you. The 311 will soon have you smiling and feeling good again though.